Our favorite review for this chicken and feta skillet is from someone who didn't get to have it for lunch that week because her son ate all the leftovers! Cook chicken in hot oil in large skillet on medium heat 8 min. or until chicken is browned on all sides, turning occasionally. Remove from skillet. Drain skillet, reserving 1 Tbsp. drippings in skillet. Add onions to skillet; cook and stir 1 min. 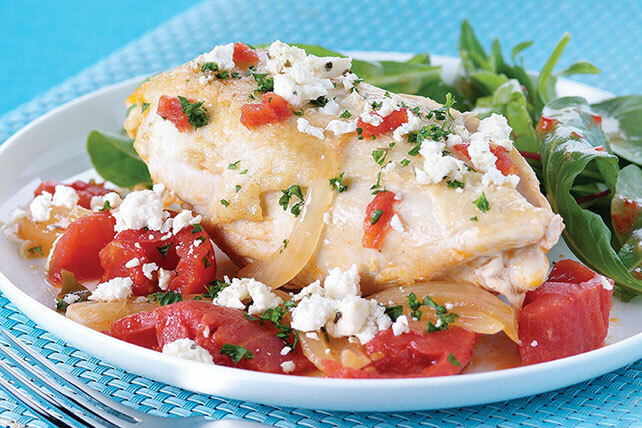 Return chicken to skillet; add tomatoes. Cover. Simmer on low heat 25 min. or until chicken is done (165ºF). Top with cheese and parsley. Serve with a mixed green salad and piece of your favorite fresh fruit.